DES MOINES, IA - Head Coach and Director of Football Operations Mike Hohensee announced today that the Iowa Barnstormers have been assigned veteran defensive lineman Rodney Gnat to a 2-year deal. Gnat (6-3, 260, Louisville) has collected a total of 27 tackles and 6.5 sacks throughout his professional football career with the Iowa Barnstormers. 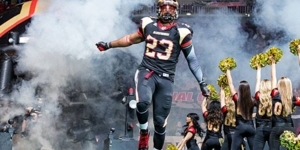 2014 will mark Gnat's third season both in the League and with the Barnstormers franchise. Not only has he proven to be a fan favorite, but Gnat has also been recognized by Barnstormers coaching staff for his outstanding work ethic. Gnat played four seasons for the University of Louisville where he recorded 55 tackles and 11.5 sacks in 44 career games. The Iowa Barnstormers home opener is shceduled for April 12, 2014 against the San Antonio Talons. Season tickets are already on sale for as little as $110 per seat. Don't miss a minute of the action this season! To order your seats or for more information, please call the Barnstormers at (515) 633-2255, or log onto www.theiowabarnstormers.com.